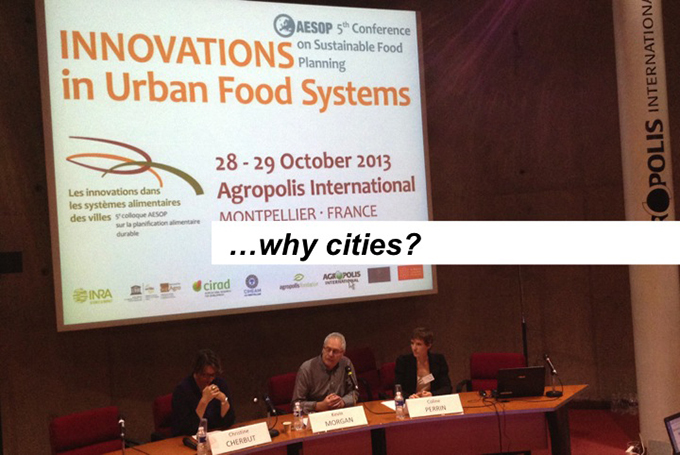 AESOP (Association of European Schools of Planning) 5th conference on Food Urban Planning took place in Montpellier the 28th and 29th of October and gather the scientific community at the cross roads of urban planning and agriculture. A challenge in some way as agriculture and the city have always been historical enemies and two separate worlds most of the time in conflict. 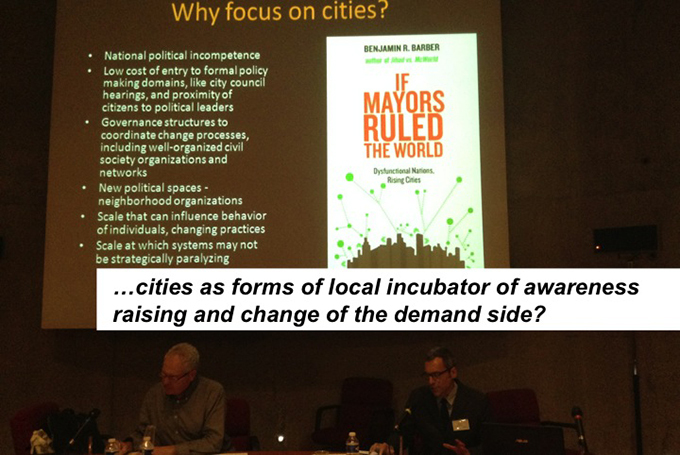 It is somewhat still the case for part of agriculture scientists still reluctant to deal with urban environments. But the growing success of this conference over the last venues builds on the trend of cities dealing more and more with food issues although this topic being outside their legal competences. Growing food in the city has even become a trend and an issue of gentrification in city warns Kevin Morgan chairing the opening of the conference: community gardens and orchards in public parks are part of the marketing of a greening cities. The conference and the program of side sessions were organized around 3 themes: Flows of people, good, materials and knowledge that create urban food systems and reshape rural/urban linkages and help us to rethink or reframe urban food sheds; Land and the preservation of farmland as a major challenge for the urban planning community; Governance and how innovative or community food strategies emerging differently in cities may combine towards food justice. 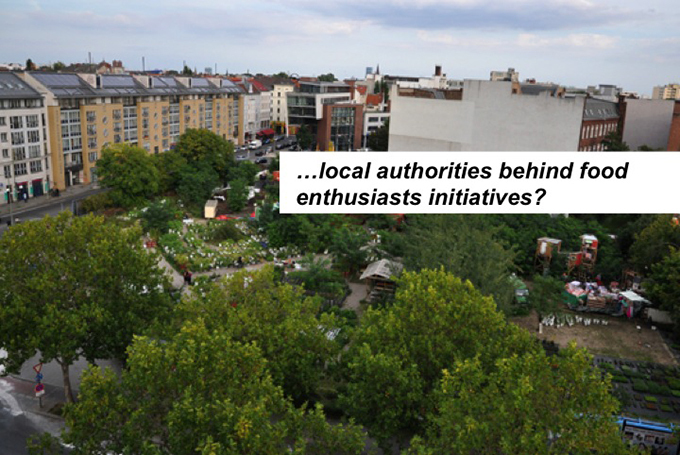 The following notes intends to pick-up some of the rich and multiple emerging questions – mainly from the Governance track – brought by the presentations that may be relevant and inspiring for our URBACT network. Marco Clausen, one of the founder of Prinzessingärten in Berlin presents one among the famous success stories of growing food in the city starting on a wasteland in the center of the German capital with a rapidly growing community of enthusiasts first planting food and rapidly hosting a large range of side activities from gardening classes for kids, bee keeping activities, organization of workshops to hosting a local farmer market, an organic restaurant and a recreational bar. The garden turns to be a hub for alternative consumption and an attractive symbol of counter culture in a paradoxical situation of both raising interests among the population for the area with still the status of a temporary and precarious project. Caroline Brand from Grenoble University stresses positive aspects of a somewhat naive enthusiasm for urban food projects gaining general approbation with a strong potential of attracting attention of politicians and loosing potential conflict of interests between stakeholders in the city around more involvements on food issues. 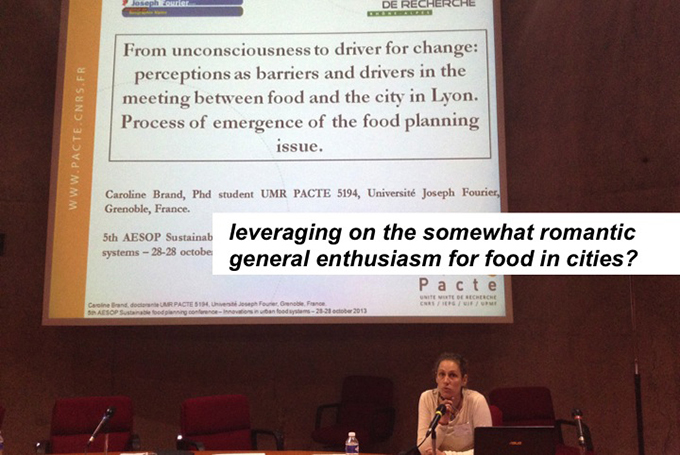 Whereas Marketa Braine-Supkova, IUFN survey among local authorities in France reveals a general lack of knowledge and low interest in complex urban food issues, it is certainly a clever strategy to ride this somewhat romantic general enthusiasm for food resilient cities, strengthening local authorities interests and securing stakeholders involvement before facing the many complex problems raised by the topic. Romain Feche and Max Rousseau from CIRAD focus on a sample of all food related initiatives represented in Montpellier and tried to refine the on-going typologies discussed in the literature distributing the local initiatives in 3 categories: the ‘reformists’ (i.e. food banks, solidarity groceries, restaurants, Slow Food Languedoc, etc.) intending to counterbalance the negative effect of current food system; the ‘progressivists’ (i.e. CAS, food purchase groups, local branch of Incredible Edible, etc.) supporting alternative food system parallel to mainstream and the ‘radicals’ (i.e. Food not Bombs, etc.) aiming at a more structural transformation of the current system. This typology asks if all these initiatives constitute or not a food movement aiming at more food justice locally. 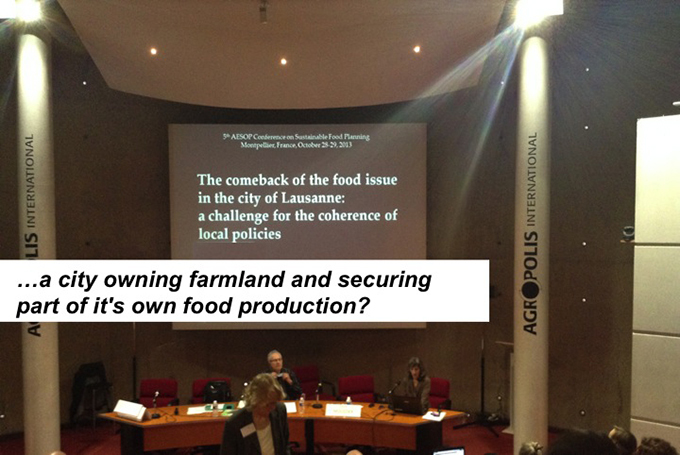 The analysis of the Montpellier context reveals interrelations but also obvious limits in cooperation to aggregate into a stronger and articulated food movement. The FP7 Foodlinks – Using knowledge networks to promote sustainable food [http://www.foodlinkscommunity.net] European funded research project engage in knowledge brokerage activities between scientists, civil society actors and policy makers along 3 themes: Short producer to consumer food chain; Re-valuing public food procurement and Urban food strategies. From the last theme, a Rough Guide to Sustainable Food Systems [http://www.foodlinkscommunity.net/fileadmin/documents_organicresearch/foodlinks/publications/Urban_food_strategies.pdf] gives an overview of the process from stakeholder engagement, assessment of the current food system; collective definition of a common vision and related goals prior to unroll a plan of concrete actions followed by monitoring and evaluation processes. Beyond cities as territory for implementing a local sustainable food system, Nevin Cohen, The New School discuss till what extend cities can play a transition role in fostering the change from incumbent food regime to a more just and resilient food system. The results of his study in height canadian and US large cities where interviews with stakeholders have been conducted points a key role of cities in undermining confidence in the current food regime and creating forms of local incubator of awareness raising and change of the demand side. 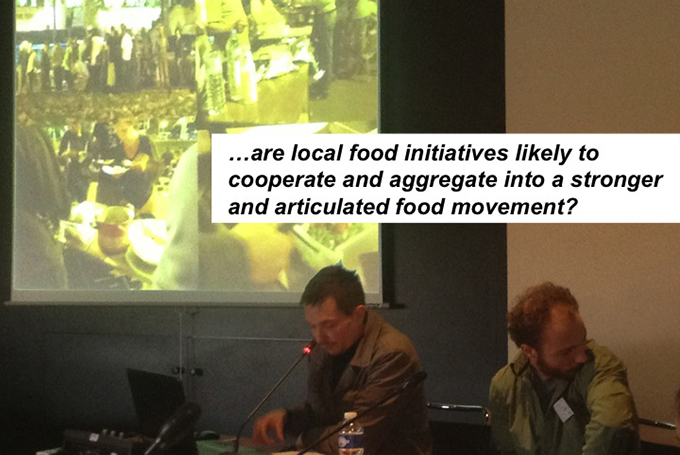 SURFOOD project [https://sites.google.com/site/programmesurfood/] standing for Sustainable Urban Food Systems is a federation of 15 research lab from Montpellier building on the hypothesis that urban scale is pertinent for sustainable food systems governance and that valorization of diversity at all levels of a food system and combinations of varied agencies may be a resilient assets. 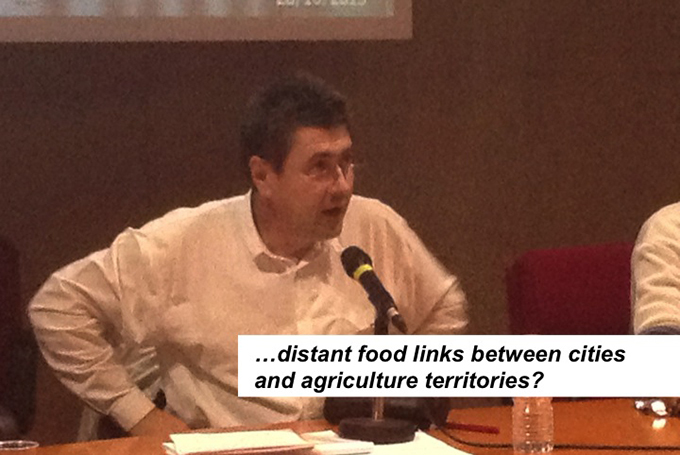 Among the many tracks of research in SURFOOD, project co-ordinator Nicolas Bricas, CIRAD is pointing towards the interesting notion of distant links between cities and agriculture territories. Distant links means for instance possible twinning between a particular urban neighborhood and a rural village with both tight partnership in the form of a CSA and optimized logistics. Françoise Jarrige, Supagro studied the case of Lausanne, Switzerland that started in the 18th century to buy agricultural farmland in the neighboring municipalities but also in the hinterland alpine pasture. The initial scope of food self-sufficiency of the city was blurred in the last decade by the classical city expansion but recently turned back among the preoccupations of sustainable transition of the city. Lausanne builds on that agrarian heritage and still on-going production showing another way for a city to secure its food consumption. Some large cities in China and in the Emirate are in this process of buying distant land to ensure a capacity of food production and twinning contracts are existing at the level of municipal school canteens and food production areas. The environmental impact of transport increased by the (reasonable) distance may be reduced by an efficient logistic potentially easier to optimize between 2 defined points than multiple short circuits between single farmers and urban citizens. The fact of targeting distant land may also contribute to unlock the bottleneck of preserving near farmland against the pressure of urban expansion. 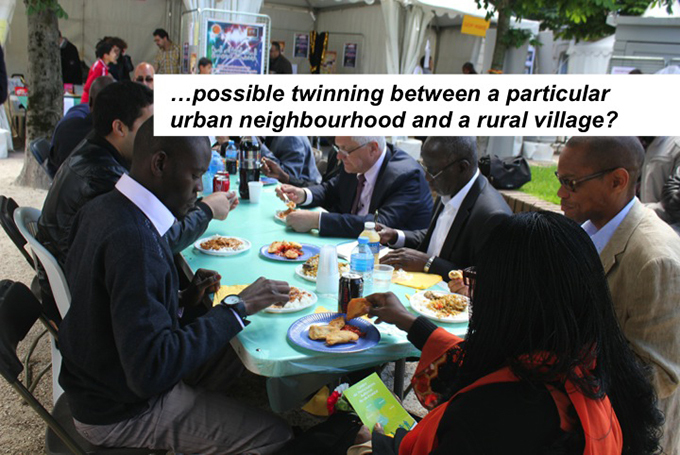 Last but not least, such rural-urban twinning have a potential of building strong social ties. An inspiring image could be found in the associations de ressortissants in Dakar that are communities of expats coming from the same rural area and joining forces for a rural-urban co-operation. Food is emerging as a key issue for cities but the acknowledgement of it in the policy framework is still a long way to go. For instance, very surprisingly food is completely absent from EU policies such as the Smart Cities Strategy or the requirements to apply for the Green Capital Award.